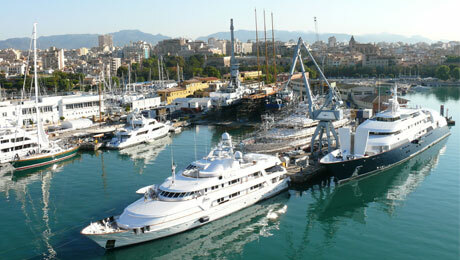 A 'one stop' Superyacht Service Centre..
Centrally located in the Port of Palma and only a short walk from the city centre, Astilleros de Mallorca was one of the first facilities of its kind to provide a full ‘one stop’ Superyacht Service Centre in Mediterranean Spain. They have four slipways, the largest being 74 metres in length with a maximum hoisting capacity of 1700 tons. Each slipway and berth has telephone and Wi-Fi connections and for items that need to be removed during repair or refit, there is an open rig storage area of 1500sqm, serviced by a 25 ton capacity crane with a further 1500sqm of sheltered storage for deck and interior items that could be damaged during a refit. Private lockers are also available upon request. Three cranes service the shipyard, one of 25 tons, one of 10 tons and one of 5 tons, and there is an outfitting quay of 220 metres in length for yachts up to 110 m. re-launched or awaiting haul out. 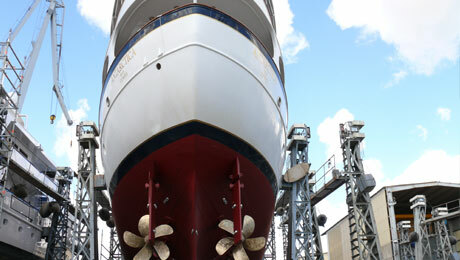 Superyachts undergoing repairs or refits here are allocated a project manager to co-ordinate all the services used whilst the yacht is in the yard. Within the yard, workshops equipped with the very latest in modern tooling technology include steel and metal fabrication, a machinery shop, carpentry, electrical engineering, hydraulic and rigging. The panoramic restaurant lounge area is serving local and international dishes, which is available to all Astilleros clients and staff, a real plus for yachts in refit. They also have the following in-house companies working within Astilleros facilities… Tekamar, Air Cold, Estay Electronics, Soft Interiors, BWA Yachting, Busycon, Nauti Paints, Undercover Solutions and Trabajos en Cabos. Security is excellent, with a manned twenty-four hour door watch with ‘pass only’ access at the main entrance gate. In order to expand and cope with ever increasing market demands, Astilleros de Mallorca opened a second office in the upgraded public travel-lift area (STP) with two fully equipped mechanical and metal workshops, ‘state of the art’ machinery… such as a lathe, milling machine, hydraulic press, welding bench, hydraulic test bench etc. As a result, the Project Managers can provide their clients with a more rapid response inside the yard. The office located next to the 700 T travel-lift in the centre of the yard, makes it easier for Captains and crew to drop by to discuss their service needs. Captains spoke highly of the expert multi-lingual administrative and technical staff that oversee all projects and ensure that whilst their vessel is in the yard, the refit runs as smoothly and as efficiently as possible.